Brockmire is an American 30 minute scripted sports television series, which kicked off on April 5, 2017, on IFC and is broadcast every Wednesday at 22:00. The show is currently in its 3th season. IFC has officially confirmed the renewal of Brockmire for Season 4. The exact release date is yet to be announced so far. Sign up to track it down. 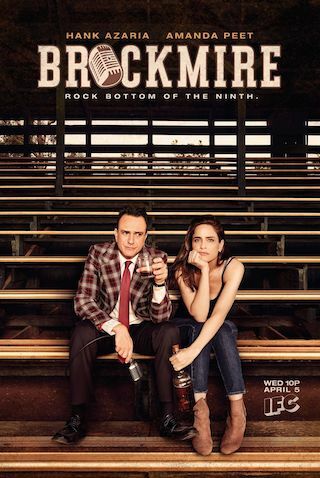 Brockmire is a famed major league baseball announcer who suffers an embarrassing and very public meltdown live on the air after discovering his beloved wife's serial infidelity. A decade later, Jim Brockmire decides to reclaim his career and love life in a small American rust belt town that has seen better days, calling minor league baseball games for the Morristown Frackers. The struggling team is led by Jules, the strong-willed, hard-drinking owner and Charles, the naive but enthusiastic team intern. October 18, 2018 - IFC today announced details and guest stars for Season 3 of Brockmire, the critically acclaimed comedy series starring Hank Azaria as Jim Brockmire, the garrulous, recently-sober baseball announcer who's climbing his way back to the major leagues. Produced by Funny or Die, Brockmire is currently in production in Atlanta and will return to IFC in spring 2019 with eight all-new episodes. Returning stars include Amanda Peet as Jules, Brockmire's ex-girlfriend, Tyrel Jackson Williams as Charles, Brockmire's entrepreneurial best friend and Becky Ann Baker as Jean Brockmire, his weathered and tough-love older sister.